An inspiring look at how a community comes together to provide something for the benefit of everyone and everything in the area. Keep watching to find out how people in the UK can create their own Permaculture Offshoots Community Project which comes with technical training, support and a whole range of benefits that creates opportunities for present and future inhabitants of Earth! Anne Wensley has owned native bees just outside her front door in her garden. 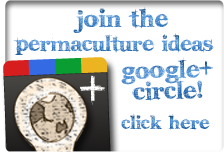 On this short interview she tells how she came across them and their uses in a Permaculture garden. The Eco-Dome is a small home design of approximately 400 square feet (40 sq. meters) interior space, using Permaculture principles to utilise local resources. It consists of a large central dome, surrounded by four smaller niches and a wind-scoop, in a clover leaf pattern. Learning and building an Eco-Dome is the next stage after building a small emergency shelter and provides hands-on learning experience in the essential aspects of Superadobe construction. It's small size of approximately 400 square feet (interior space), makes it a manageable structure for the first time owner builder. The finished "very small house" is self-contained and can become a small guest house, studio apartment, or be the first step in a clustered design for community use in an Eco-Village of vaults and domes. Built from local earth-filled Superadobe coils (earth stabilized with cement or lime). living room, entrance hall, and three bed-rooms. living room, entrance hall, two bedrooms, and a bathroom. Self-contained single unit (potential for a guest house or studio apartment) or double unit (larger family residence). Can be repeated and joined together to form larger homes and courtyard houses. Can be built by a team of 3-5 persons. Designed with the sun, shade and wind for passive cooling and heating. Wind-scoop can be combined with a rated furnace unit, depending on local code approval. Solar energy and radiant heating may be incorporated. Interior furniture can be built-in with same material. The Blueprints for this design have been previously approved and built in Hesperia City and San Bernardino County, California, as well as other regions nationally and internationally. documentary step-by-step DVD "Eco-Dome, building a small home", construction documents (mini-version, including the construction specification), unfilled Superadobe roll/earth-bags, educational book on Superadobe construction entitled "Sandbag Shelter and Eco-Village". construction document blueprints, engineering calculations as permitted under the 1997 UBC / 2001 California Code, construction specification, title 24 energy calculations, and the engineering record. All plans are numbered. The above plans and materials are used in the Cal-Earth apprenticeship courses. For more information on purchasing these construction documents, please contact us for additional information. The above plans and materials are used in the Cal-Earth apprenticeship courses. Price: $3,200 for either option. The Eco-Dome plan is a part of the Cal-Earth educational and research program. It is an educational construction document developed to be used in conjuction with the Cal-Earth apprenticeship course. All plans and construction must be confirmed with local building and safety departments and prevailing local codes. Cal-Earth Institute, architect Nader Khalili, and their representatives and officers are not responsible for product defects, the actions or effects of individuals who build from these plans or follow it's instructions. Builders are expected to use commonsense, caution, safety precautions appropriate to a construction site, and all necessary protection to persons and property. Superadobe Technology, U.S. patent #5,934,027, has been tested on individual domes and vaults (1993-1996) for the City of Hesperia, California, Building and Safety Department, in consultation with I.C.B.O. These structures passed the California required codes. Superadobe/sandbag technology has been patented in the United States and overseas, to protect the innovator's right to make it freely available to the needy of the world and to the owner-builder, and to license it for commercial use.